Our aggressive overconsumption of natural resources—over-fishing, over-harvesting forests, over-extracting fossil-based energy and minerals, all driven by over-populating—has resulted in the over-emission of more atmospheric carbon dioxide than nature can sequester. The short-to-long-term disastrous consequences of this ‘overshoot’ include shrinking biodiversity, collapsed fisheries, eroded topsoil, social turmoil, and, most potentially damaging of all: climate change. It’s no fun serving as a gloomy messenger of potential doom, but for a multitude of evasive reasons, most people resist acknowledging and facing harmful realities. And it’s not because we haven’t been forewarned. 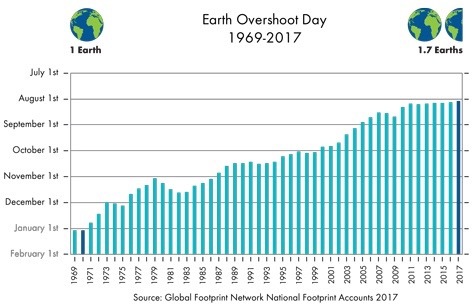 Prophetic voices have been sounding alarms about overshoot for decades, with a chorus of voices raised during the 1960s and 1970s. But since we haven’t yet encountered Armageddon, and somehow managed to “muddle through” tough times, complacency reigns. The postponement of tackling the mounting challenges may be attributed to continuing advances in technology, ongoing constructive efforts of environmental organizations, and even mass psychology, the latter promoting an optimistic belief that everything will eventually improve—somehow. So far, it seems we’re becoming even more mired in delusional thinking, and ineffective in ameliorating humanity’s headlong rush towards catastrophic ruin. Articles in this issue address a wide range of issues, from views about capitalism and perpetual growth to news about water safety and the potential for armed conflict. Several constructive solutions that are being instituted the world over are listed, with innovative ideas and practices that are open to adoption by anyone desiring to become an activist. I’m sure most of us want to be participants in finding and enacting solutions, rather than moaning, groaning, and bemoaning the existing and developing world crises. Some positive action each of us can take is to seek optimal ways to reduce, reuse, and recycle as much as possible. If we can maximize our efforts in addressing these three powerful individual actions, Individually and collectively, we will be taking a giant step in creating greater resilience and sustainability. Why, it might even be possible for us to eventually undershoot our consumption of resources! What do you think? > Medium: Do You Still Feel Capitalism Dying? (Joe Brewer). Can you feel capitalism dying around you? There is a mental disease of late-stage capitalism causing deep worry and anxiety, prompting feelings of severe isolation and humiliation, combined with a profound sense of powerlessness for millions of people around the world. The question I ask today is What are YOU going to do about it? > Open Democracy: Biological Annihilation And The Sixth Mass Extinction (Robert J. Burrowes). Human beings are now waging war against life itself as we continue to destroy not just individual lives, local populations and entire species in vast numbers but also the ecological systems that make life on earth possible. By doing this we are now accelerating the sixth mass extinction event in earth’s history and virtually eliminating any prospect of human survival. > Medium: What’s Really Driving The Global Economic Crisis Is Net Energy (Jonathan Rutherford). A recent HSBC report found that somewhere between 60–80% of conventional oil fields are in terminal decline. In coming decades the global economy will very likely face an increasing deterioration in net energy supply that will increasingly choke off economic growth. We have no choice but to prepare for a future economy in which net energy is far lower than what we have been used to in the industrial era. > Resilience: Is Growth Natural Or Inevitable? (Giorgos Kallis). Perpetual growth is not encountered in nature. When a population grows too much and consumes too many resources, it collapses before a new ecological balance with other species is reached. Economic growth, as a desirable goal, is a phenomenon that appeared only in the last two centuries and only in some parts of the world, primarily due to state intervention. Happiness research shows that material growth does not increase emotional wellbeing; equality does. > Cassandra’s Legacy: Stereocene: The Future Of The Ecosystem (Ugo Bardi). The term “Stereocene” (the age of solid-state devices) could be suitable to describe a new stage of the earth system in which humans could have access to truly gigantic amounts of useful energy, without necessarily perturbing the ecosystem in the highly destructive ways that have been the consequence of the use of fossil fuels during the past few centuries. > Resilience: Help Us, Strategic Climate Communicators, You’re Our Only Hope (Mike Sandler). Strategic climate communicators still don’t know what will be successful. The extent of our failure is of Biblical proportions and continuing. In the meantime, everyone should do everything, all the time, even if it means finding motivation by thinking about an uninhabitable world. > The Guardian: Planet Has Just 5% Chance Of Reaching Paris Climate Goal, Study Says (Oliver Milman). The Paris accord, signed by 195 countries, commits to holding the average global temperature to “well below 2C” above pre-industrial levels and sets a more aspirational goal to limit warming to 1.5C. This latter target is barely plausible, the new research finds, with just a 1% chance that temperatures will rise by less than 1.5C. > New York Times: Loss Of Fertile Land Fuels ‘Looming Crisis’ Across Africa (Jeffrey Gettleman). Africa itself has a land problem. Overpopulation, climate change, soil degradation, erosion, poaching, global food prices and even the benefits of affluence are exerting enormous pressure on African land, fueling conflicts across the continent. Large groups of people are on the move, desperate for usable land. By the end of this century, there could be as many as four billion people on the continent. > The Deviant Investor: In A Better World (Gary Christenson). The global financial system, based on “dishonest” fiat currencies, is dangerous and unstable. Potential wars with North Korea, Russia and China will aggravate an already dangerous economic structure. Existing wars in Syria, Iraq, Afghanistan and elsewhere have been costly in terms of soldier deaths, excessive expenses, and un-payable debt. Central banks and governments want more debt, more currency in circulation, and higher prices, so … expect more wars. > Common Dreams: Warnings Of ‘Nuclear Nightmare’ As Trump Escalates Tensions With World Powers (Jake Johnson). We need to step up sustained diplomacy. Firing off a bunch of missiles does nothing to address the crisis. We need negotiation, not posturing. > MPR News: Getting To Clean Water: Complex Problem, No Easy Solutions (Kristi Marohn). Forty percent of the state’s lakes and streams are polluted, and many aren’t safe for swimming or fishing. Three out of four Minnesotans rely on ground water for drinking. But in many areas, it’s contaminated with nitrates from fertilizer, animal waste or human sewage. > NPR: The Gulf Of Mexico’s Dead Zone Is The Biggest Ever Seen (Dan Charles). This week, NOAA announced that this year’s dead zone is the biggest one ever measured. It covers 8,776 square miles—an area the size of New Jersey. And it’s adding fuel to a debate over whether state and federal governments are doing enough to cut pollution that comes from farms. > Common Dreams: To Protect Our Planet And Revitalize Our Economy, We Need A Climate Conservation Corps (David Baake). Faced with these enormous economic and environmental challenges, we need to think big. Luckily, there is an elegant solution to both problems, with precedent in U.S. history. The solution is to create a Climate Conservation Corps to put Americans to work fighting climate change. > Star Tribune: Farmers In Minnesota And Wisconsin Are Now Recycling Millions Of Pounds Of Plastic (Tom Meersman). Minnesota and Wisconsin farms generate 60-80 million pounds of plastic each year. Revolution, an Arkansas-based company, is now collecting from farms that use at least 2,000 pounds of plastic annually. The plastic is transported to a processing plant in Arkansas to be washed, shredded, heated and extruded into plastic resin pellets, which can be used to make other products. > On The Commons: Boosting Health In Everyone’s Hometown (Jay Walljasper). According to a landmark University of Wisconsin study, the state of our overall health is attributable to four major factors: 1) access to and quality of clinical health care (20%); 2) social and economic factors in our lives (40%); 3) individual factors and behaviors (30%); and 4) the physical environment in which we live (10%). We we can improve these factors to boost everyone’s health, no matter where they live. > Common Dreams: Can The Age Of Trump Spur Medicare For All? (Ann Jones). A single program launched by a single state is better than none. And it just might work. Social-democracy countries, like Sweden, have successful universal health care programs, and only a few states are larger. Progressive income taxes will be required, which means persuading the rich and corporations to cooperate. > Nature Conservancy: Stopping The Cycle Of Dead Zones In The Gulf Of Mexico (Justin Adams, Larry Clemens). Conservation success hinges on the collaborative spirit of cities, farmers, agribusiness and policy makers to embrace science-based solutions, both on the ground and at the policy level. Then we’ll really have a bull market [in environmental activism], and hopefully in response, smaller dead zones, cleaner water, and healthy crops. > Common Dreams: A Manual For A New Era Of Direct Action (George Lakey). Most organizers chose not to address deeper questions of class conflict and the role of the major parties in doing the will of the 1 percent. What worked for the civil rights movement in facing an almost overwhelming array of forces was a particular technique known as the escalating nonviolent direct action campaign. Some of the applicable lessons learned are listed, with explanations. > GrowthBusters Webinar: Fewer Children: A Moral Responsibility, Wed., August 9, 2017, 9 pm EDT, 75 Minutes; Panel: Travis Rieder, bioethicist, and Madeleine Somerville, writer/blogger/columnist. Link: https://www.growthbusters.org/webinar-fewer-children/.